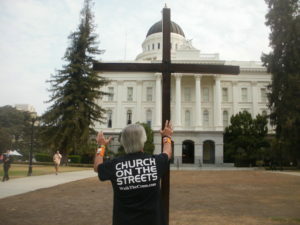 I came to Fresno to specifically pray for the city’s gang-threatened police department! Every city and town has a thin blue line, referring to the courageous police officers who are sworn to serve and protect that community’s residents. This thin blue line of police protection is similar to the thin blue line of the Earth’s atmosphere known as the Ozone Layer, which protects us all from the Sun’s harmful and deadly rays. Without such a thin blue line protecting it’s city from criminals and outlaws, our society wouldn’t remain civilized or normalized for long. After reading a disturbing article in my city’s daily newspaper, The Bakersfield Californian, I was impressed by the Lord of the harvest to drive the go-ye-mobile to Fresno, a city of about 500,000 souls and walk the cross throughout this large central California metropolitan area.